Sushi is one of my favorite foods. About 20 years ago when I was just a young lass, my older cousin got a sushi kit and made sushi at home. I thought it was so cool and had always wanted to learn it myself. It took a while for me to get there, but finally a few years ago I received (OK, requested) a sushi kit from R. for my birthday and started learning to make simple rolls. After only a few attempts, however, I took a 2.5-year hiatus from making sushi for a number of reasons, one of which was that it is just hard to make sushi unless you are serving a large group of people as it is extremely time consuming and the sushi rice doesn't last very long so it isn't something you can save as a leftover. Anyway, fast forward to a couple of weekends ago when I had my little ice cream gathering. I had promised appetizers, and I thought I would finally have the critical mass I needed to make some sushi rolls. I went with the basic cucumber roll and sweet potato roll because my sushi-making skills were extremely rusty and this was not the time to try something complicated! The first key to making good sushi is to make good sushi rice. The recipe I use was adapted from different sources, mainly from the book that came with my sushi kit as well as this recipe from Food.com, and though I don't make it nearly often enough, it has served me well whenever I have made it. A wodden flat-bottom sushi rice bowl (looks like this), though a glass dish is OK as well. Drain rice for 1 hour in the winter, 30 mins in the summer. Combine rice vinegar, mirin, sugar, and salt in a small saucepan and heat gently until the sugar dissolves, stirring constantly. Spread the cooked rice evenly in a shallow, flat-bottom wooden bowl or glass dish. Gently separate the grains with a spatula or a rice paddle and add the vinegar mixture at the same time. The rice should not be too moist. Fan the rice until it reaches room temperature. Don't let it get too cool or it won't stick as well. Note that sushi rice only lasts one day, so it should not be made ahead. Sushi rice is not just for traditional sushi rolls or nigiri, but can be enjoyed in other ways as well. Scatter fish over a bowl of sushi rice to make chirashi. I sometimes serve it with grilled salmon. 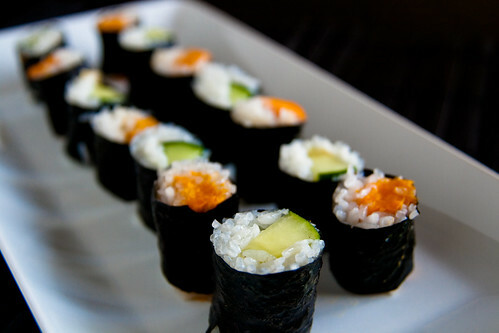 OK, now that you have the rice, how do you make the sushi rolls? I describe what I did in the directions below, which is a combination of techniques I learned from the book that came with my sushi kit, various web sources (such as this one), and observations of my own. Prepare sushi rice according to recipe above. Cook filling if necessary. Cut the filling into long strips. Wrap bamboo mat with saran wrap (this prevents the rice from sticking to the mat which makes it hard to clean). Place mat on a dry chopping board. The bamboo sticks should be aligned horizontally (so you can roll the sushi forward). Divide rice into 8 to 9 equal parts. Divide a sheet of seaweed in half. Place the halved sheet of seaweed horizontally on the bamboo mat, with the shiny-side faced down. Dip hands in vinegared water mixture. Spread one part of rice on seaweed evenly and gently. At the far end of the seaweed, leave about a 1-inch space free of rice. Be careful not to use too much rice or the roll won't stick to itself! If desired, run a little wasabi along the rice at the end closest to you. 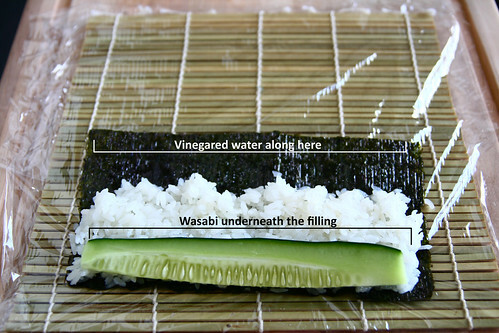 Place desired filling on top of the wasabi. Wet the strip of seaweed not covered in rice with vinegared water mixture. Lift the front of the bamboo mat closest to you and roll the sushi. Tighten the roll by pressing firmly. The roll will stick to itself once you're done rolling. Repeat until you're done with all the ingredients. It takes time to figure out how to make presentable sushi, but practice makes perfect! If the roll is too full, it won't stick to itself, so try using less rice. It took a lot of experimenting for me before I figured out the most appropriate amount of rice to use, and still I would keep making mistakes. The vinegared water is the secret to not having rice all over your hands. It is also very important to dab it on your knife before cutting each roll; otherwise, it won't cut well. Not all soy sauce is the same. Make sure you eat sushi with Japanese soy sauce, not Chinese soy sauce! Not all chopsticks are the same. Compared to Chinese chopsticks, Japanese chopsticks are shorter and have tapered ends (as opposed to the blunt ends on Chinese chopsticks) that make them easier to pick up delicate foods such as pickled ginger. It took a while to get a few pieces that looked somewhat presentable... I need more practice!